After seven years of stagnation, the federal minimum wage is a hot topic of debate during this presidential election, and this will affect many nonprofit workers in very-low-wage jobs like childcare and direct care for the disabled. Currently, 29 states have implemented a minimum wage that is higher than the minimum set by the federal government at $7.25. Yet, even in those states, individuals earning the minimum wage have trouble making ends meet. In fact, an individual working full time at the federal minimum wage would just barely be at the poverty line after taxes. When the Federal Labor Standards Act was passed in 1938, the minimum wage was set specifically so individuals of all skill levels could earn “more than a bare subsistence level.” This statement can be a bit vague, however, as the subsistence level depends on location. 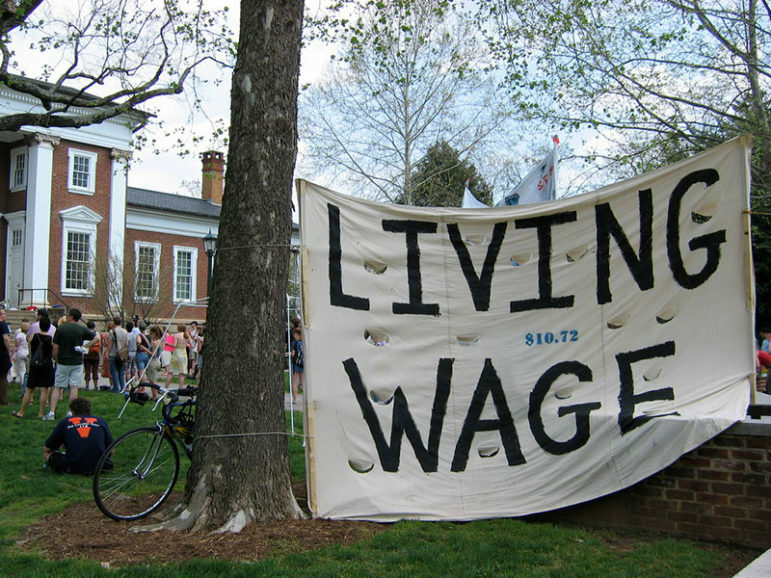 For instance, Virginia has opted to keep its minimum wage at the federal $7.25 hourly rate. However, depending on where you live within the state, the average rent for a one-bedroom apartment ranges from $700 to upwards of $2000. This becomes more convoluted when we consider that many people live in Maryland and Virginia but work in Washington, D.C., and vice versa. The Metro D.C. area shares a high cost of living, but depending on whether they work in Maryland, where the minimum wage is $8.75, the District, where the minimum wage is $11.50, or Virginia, an individual’s financial situation can differ widely. What this means for people earning minimum wage is the need to make difficult decisions about basic living needs, even housing. Back in 2009, when the current minimum wage went into effect, the National Coalition for the Homeless indicated that 44 percent of residents in homeless shelters had full-time jobs and were making the minimum wage. Stephanie Berkowitz, president and CEO of Northern Virginia Family Service, estimates that 70 percent of the people using the organization’s housing program are working and 60 percent of the individuals in their homeless shelters are employed. In terms of meeting the “bare subsistence level,” it would seem that someone working forty hours a week should at the very least be able to afford housing. In recent years there have been important developments in the academic literature on the effect of increases in the minimum wage on employment, with the weight of evidence now showing that increases in the minimum wage have had little or no negative effect on the employment of minimum-wage workers, even during times of weakness in the labor market. Research suggests that a minimum wage increase could have a small stimulative effective on the economy as low-wage workers spend their additional earnings, raising demand and job growth, and providing some help on the jobs front. After years of effort, it appears that the “Fight for $15” campaign is gaining ground. Just a few months ago, District officials approved raising the minimum wage in Washington, D.C. to $15 per hour by 2020, increasing the rate by about seventy cents a year. A handful of other states and cities have also agreed to raise the minimum wage to $15, putting more pressure on Congress to raise the federal minimum wage. For nonprofits paying less than a living wage, any advocacy should include aggressive provisions for raising rates to cover costs. But the train seems to be leaving the station and nonprofits need to be involved, as they are in many cases. Searching for a rationale for keeping nonprofit workers on wages too low to live on? Try these out—straight from Silicon Valley!